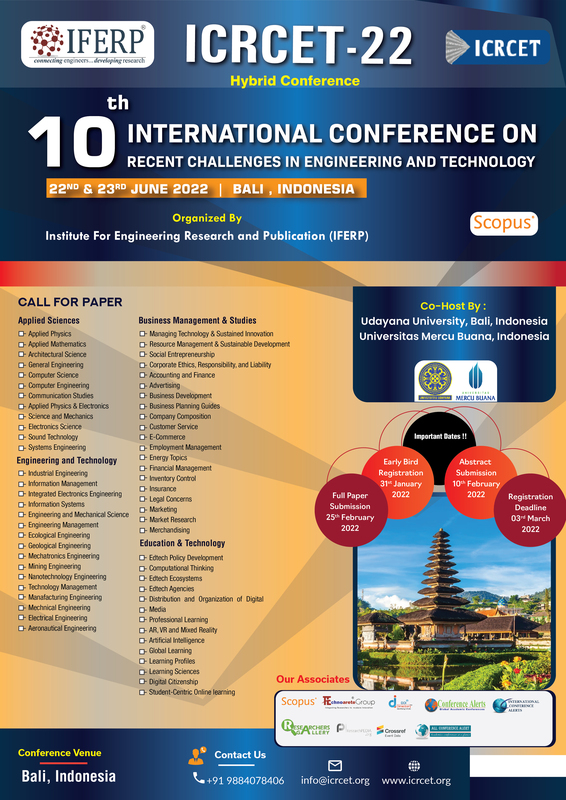 4th International Conference on Recent Challenges in Engineering and Technology (ICRCET-2018). It is going to be held on 30th - 31st January 2019 at AP, India. ICRCET - 2018 is being organized by Annamacharya Institute of Technology & Sciences, and Institute For Engineering Research and Publication (IFERP). To provide an opportunity to research scholars, delegates and students to interact and share their experience and knowledge in technology application. ICRCET - 2018 will provide an excellent international forum for sharing knowledge and results in Recent Challenges in Engineering Technology. The aim of the Conference is to provide a platform to the researchers and practitioners from both academia as well as industry to meet and share cutting-edge development in the field. ICRCET-18 will be a perfect platform for students of post graduate and undergraduate levels to express their innovative thoughts and unique research work at a global platform. ICRCET-18 will provide scopes to students to meet and interact with International Speakers and Scientists of National importance. Students can interact with session chairs related and working on relevant fields of their research. Students can publish their articles in reputed journals of International importance. Journals associated with ICRCET conference are published in UGC, Scopus and Academia. Articles presented at ICRCET-18 will be available for citation at reputed scientific repositories like science Direct, Research Pedia and Academic library. ICRCET-18 will be a perfect platform for Faculties, Professors, academicians to express their innovative thoughts and unique research work at a global platform. ICRCET-18 will provide scopes to faculties to meet and interact with International Speakers and Scientists of National importance. Professors can interact with session chairs related and working on relevant fields of their research. Faculties can publish their articles in reputed journals of International importance. Journals associated with ICRCET conference are published in UGC, Scopus and Academia. ICRCET-18 will create a bridge between Industrial professionals and Academic professionals which leads to exchanging of approaches and ideas about technological innovations. ICRCET-18 will provide a platform to Industrial professionals to exhibit their recent researchers which help to drive the global world. Industrial professionals can publish their articles in reputed journals of International importance. Journals associated with ICRCET-18 conference are published in UGC, Scopus and Academia.